I don't know about where you all live, but it has been so warm and beautiful here in Indy! It has made my kids extra energetic, but I can't really blame them. I've been itching to get outside, too! So much so that the thought of driving to the gym and starting out the windows at the sun and warmth has been unbearable. I didn't want to miss out on my workouts and this weather, so I came up with an outdoor-friendly exercise circuit! 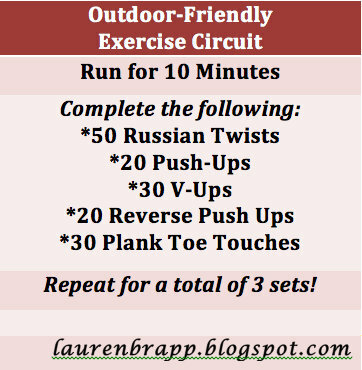 It was so easy to do, and I knew I had to share it since it does a nice job of targeting legs (running - but only for 10 minutes at a time so don't worry you non-runners! ), arms and abs. Best part? You'll be done within 45 minutes, and you could easily do this at a gym if you're not enjoying nice weather. Repeat for a total of 3 sets! The moment you cannot feel your lower abs working or you feel other muscles are doing the exercise for you, stop. Take your time. Rushing through a lower abdominal exercise is never a good idea. It doesn matter how quickly you can get the reps done. Its more important to be controlled as you do them. When you do these abdominal exercises quickly, youe decreasing their effectiveness.